Commanders, we are proud to present the Exodus update of Evolution: Battle for Utopia that completes the storyline of the game with a grand finale. The Exodus wraps up the players’ adventures on Utopia with a mind-boggling twist that puts all past story events in a whole new light. In this update, you need to be prepared to meet the most dangerous new enemies in gorgeous new locations and fight alongside new powerful allies. Meet the third and final storyline update of the game! The culmination and the denouement of all open storylines, including the main one, wait for you! Buckle up: the grand finale of one of the most epic stories ever released for portable devices is ahead of you! Those who finish the game and solve the riddle of Utopia will get a nice bonus – the “Chariot of change” mode that enables you to play the game from the start in the VIP-mode. – New terror missions beginning from level 65. – The new Core location is opened after completing the Incubator location. – The Combat Knife bonus now additionally does double damage. A new bonus, “Combat Knife”, is added, allowing you to receive Skill Points when finishing off monsters attacking your Base. Now you can get daily rewards for repelling a series of Terrors. The Cloud Storage now allows you to save your game progress and copy it from one device to another. To use it, just sign into any of the suggested social networks. A new special operation, “Equalizer”, is available, starting from 65 level. The Antigravitation Technology is added, enabling you to create the VX-1909 flying machine. The Phoenix system operation has been changed: now you have to wait 6 hours after every missile launch. The new Puma Shotgun is available at the Smuggler’s for the players of 15-23 level. The special operations award system has been changed. When the special operation level differs much from your level, this spread will be considered when counting your award Skill Points. Our Support Service contact form has become more convenient and functional. It’s the biggest update yet – THE LEGACY OF DOMINION! A new PvP mode allows players to fight for Command Center control to receive useful bonuses. The mode is available to players with 500 and more Rating points. Now you can test new weapons before buying them from the Smuggler. The option is available for all the players with the VIP 1 status. You can analyze new enemies in the Reconnaissance Center. The Embassy download has been optimized and is faster now. IPhone 6 and iPhone 6+ game optimizations are included. – Now you can dismantle your old weapons and receive extra Skill Points! The number of Skill Points you get depends on the upgrade level of your dismantled weapons. – A new building: The Reconnaissance Center. Here you can analyze your enemies’ vulnerabilities and exploit the advantages in battle. – Now you can use your Promo Codes to get special rewards. – The Embassy entrance hang- up is fixed. – Other bug fixes and optimizations are included. IMPORTANT! You must have iOS8 to install the last update. In case you have previous iOS 6 or 7 then please avoid to update the game. We are working hard to support the game with all iOS versions. The next update that will resolve all issues with iOS support will be ready in a few days. Thank you for the patience and keep playing the game! – A new location: The Crystallite Deposit. This location allows you to build a Crystallite mine. – A new type of enemies that are to be finished off with a Psi Strike in a battle. When visually detected, they are distinguished with a specific skull. – A new bonus: The Visor. It allows you to get the detailed information on the enemy’s health when in a battle. – A new weapon: The Dragon AR. – A new Armor: The Chosen by Xi. When on, it provides you with one free resurrection in the PVE mode and demands you to be finished off with a Psi Strike in the PvP defense mode. – The Spartan and the Legion Armors now make you bullet- proof when in the PvP defense mode. – The Grenade Launcher damage now considers the Shotgun upgrade. – The technologies discount tasks are now counted correctly when you complete operations. Welcome the much- anticipated sequel to the epic story! Give fight to the Black Legion – the ominous army of General Kurbatov! New allies and new enemies, exciting mini games and mind- bending puzzles, maximum level increase, deadly weapons in your arsenal and solving the mysteries of Utopia – all this is waiting for you in the BLACK LEGION update! – Fixed: bug causing the game to freeze if the construction of a building is completed after the installation of the update. Dear players! If after update you are missing or can’t open locations, please contact support! New activity is available in the game, which allows you to earn skill points and additional technologies to develop the base and to expand opportunities in combat. – Incendiary damage. A new type of damage, which gives special benefits in the battles against unarmored enemies. 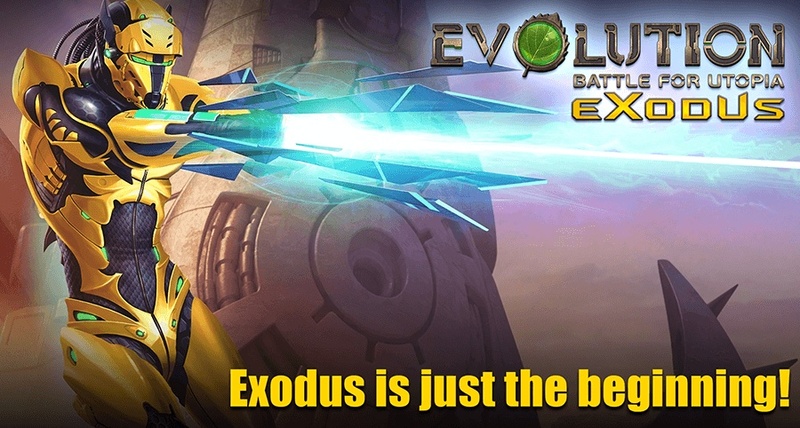 The Exodus update has been released! !